We trolled offshore on saturday out of FP. It was one of the flatest days in months so we ran offshore to the stream and water was 78 degrees and dark blue. Weed patches where 1/4 to half acre size and loaded with bait in 300 feet. We trolled north for 2 hours and stopped at every big patch to toss live herring. Not a mahi in sight. Winds started to pick up as predicted so we moved 16 miles closer to the inlet in 75 feet and tossed the anchor.Had our limit of kingfish in ten minutes so pulled the flatlines in and continued to land big triggers and average size Lanes until white caps told us to get are butts back to the inlet. Did all the kings hit live herring? I didn't make it out on Saturday but it was the best day in weeks. Not sure when the winds will die down but hopefully soon. What any suggestions on alternative blogs to follow? Follow your fav fisherman, charters, and drift boats on IG and FB. Even the posts on the hull truth dot com are better then here and those are only individual threads, not an entire forum. The problem with following charter boats is that they only post when they catch. When they don't, they stay silent. This gives you a false impression of what is biting. My last time off Miami I saw several local charter boats and heard others on the radio. Fishing was dismal, to the point that one charter boat was excited about having found some bonitos. They posted nothing that day. When making plans to go out, knowing where the fish aren't is just as important as knowing where they are. 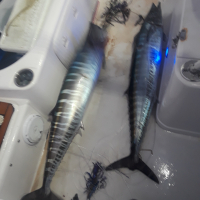 It was the lack of wahoo reports from last week that made me change my mind about chasing wahoo and instead I went bottom fishing and I was catching a few vermilion and yelloweye snapper while the charter boats were getting nothing. It shouldn't hurt someone's ego to say "today fishing sucked! ", because let's face it, sometimes it does. Same here Barrel, Saturday we anchored up in 80' of water and got four nice kings in 30 minutes. Biggest one was close to 30lbs. 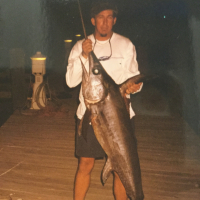 All caught with dead ballyhoo on spinning rods. That place was infested with nice size triggers (14"-17"). In addition, we caught lanes, mangroves, ARS and a nice red grouper. Congrats, sounds like a pretty good day. Curious how you rigged the dead ballyhoo? That's the exact same problem with any reporting Xenia. Maybe even that gives you a clue when they don't post something? That's also why I said follow fav fisherman. By the way, by the time you read the post it's another day. Every day is different. I honestly don't see how they are that helpful. If you're relying on fishing reports and not your own experience on when to go fishing you're gonna have a bad time. You need to build a network of fisherman. Brianb you are so negative, who would want you in their network? Members of my old network are either dead or retired! Nothing fancy, I use a long shank 4/0 hook and attach a stinger treble hook on wire. I run the 4/0 through the lips and the treble to the body of the ballyhoo, making sure the bally is straight so it doesn't spin. I there is a lot of current, I use a standard kingfish rig with a 3/8 weight. Coastal, I have given fab advice here that this forum stinks for reports and accuracy does not equal negativity, I told ya why, and I responded to a question about how to get better reports on social media and that a network of fishing friends is the best way to determine what is out there. YOU have done zero accept fall in love with me and tell me I'm negative. I never asked anyone to be in my network Coastal. Not once. So why you are asking this is just so you can have something to say and be NEGATIVE, and is yet another example of why this forum, and forums in general, are failing. Nobody that fishes daily or commercially fishes here. The fact that Joe went fishing last Saturday and trolled around and caught a snake kingfish is not helping anyone going fishing this Saturday and unfortunately most people fish on the weekends and certainly days and days after some report you saw on FS. I pick up bits and pieces of info here and there. I always check the northern reports when its fall and early winter as those fish are migrating our way. And the spring I like to check the southern reports to get a feel where the Cobia are in their move north. I never met anyone who fishes as much as I do so asking friends doesnt help as they all go out on my boat. I agree with Barrell. I'm always gathering info from any place I can. Barrell, I do like the idea of checking the north or south reports depending on the time of year.....makes a lot of sense just didn't think of it. See you learn something new every day. I've been on this site for years and years, back in the days when EMoney, Beerman, Headfirst, etc were big contributors. I learned a lot from those guys and I'm very appreciative of everything they were willing to share. Honestly, it helped change my game. I agree that the site is not what it once was and that social media is more current info. . . But there are still some good folks that share info here. I try to get as much information from as many places as possible, as it gives me a clearer picture of what's going on and helps validate the info I'm getting. Even on social media, you can have the "fisherman's delay". FS is not what it was or even what it COULD be, but to spend all the time to come on here just to knock it and be negative is pointless. . . BrianB and CC are both being negative here and it's honestly just not necessary. I thank the guys that are still willing to share info here and I will continue to contribute. Barrell, I like using the N and S section reports too, every bit of info I can get is helpful. I swear, I come here sometimes and its like a 14 year old snapchat session talking sh!# about each other instead of a bunch of dudes and dudettes that want to talk about fishing. But don't let this distract you from the fact that in 1972 a crack commando unit was sent to prison by a military court for a crime they didn't commit. These men promptly escaped from a maximum security stockade to the Los Angeles underground. Today, still wanted by the government, they survive as soldiers of fortune. sometimes I think we take ourselves too seriously, and forget that at the end of the day we are just running around, trying to outsmart a creature with a brain the size of a pea. I believe the charter captains and tackle shops dont understand how effective reports can be for drumming up business. Most do not report daily on facebook or on their own websites. Tackle shops get info all day long from people coming in for bait and tackle. A consistent daily report every night with an add slipped in about the jumbo shrimp they got in or the discount they have this week on Penn Battles, is the best free advertising a business could ever hope for. But they just dont get it. WHITES TACKLE is probably the most consistent reporter in my area. 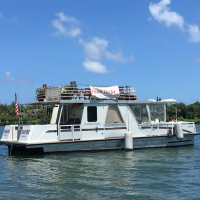 Here's a report: Went to Bayside during lunch and saw the local party boat come in with no fish. You won't see today's report on FB I bet. The folks who went swordfishing were rewarded but other than that not much lately. Did get out Wednesday and got some Yelloweyes, Vermilions, Almacos and a 10 LB Snowy though. since when is telling the truth being negative ???? Swords are the bright spot of fishing right now. I know a guy that made 5 drops and got bites on each one. Hooked two and landed one around 100 lbs. Headfirst has recently moved to New York. E$ and Beerman are still in the same places they were then. And still fishing. As am I and a bunch of the rest of the folks from then, and before. People like Brian and others are the reason there’s way less folks on here. That, and the extremely negative responses that were always heard if someone posted a pic of what a few people thought were too many fish, or too small, or too big, or over/under slot or the limit. Folks got tired of being ripped on every time they had some success. I always wondered what happened to Tim. My neighbor bought his boat a few years ago. He’s doing great. He sold his house and moved back to New York to be closer to family. I think he’s missing Florida pretty bad right now. He had up a pic of his house on FB last week. It had icicles about three feet long hang off of it and he said the temp was 4. The Forum just ain’t what it used to be. Keep the fire burning mates.